When there is no room for compromise, when you need great performance and durability, robust and easy-to-use analytical balances from METTLER TOLEDO are the perfect choice. Our analytical balances have a wide range of readability – from 0.005 mg to 0.1 mg, and capacities from 54 g up to 520 g that cover all of your analytical workflows. Outstanding weighing performance and innovative sample-handling technologies help make your challenging weighing tasks efficient, error-free and compliant. Have a question about Analytical Balances? Click here! In our brief Analytical Balances FAQ you will find answers to the most frequently asked questions, for example what is an analytical balance, what is analytical balance uncertainty or how should I calibrate my analytical balance. 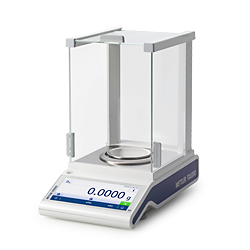 METTLER TOLEDO's Excellence level analytical balances have a readability range between 0.005 mg and 0.1 mg, and capacities up to 320 g, to cover all your analytical workflow requirements. Discover advanced quality assurance functions, such as StatusLight, LevelControl and GWP Approved, patented SmartGrid weighing pan, which minimizes the effects of air movements, as well as innovative solutions for detection and elimination of electrostatic charges. For full support with regulatory compliance and ensured data integrity, connect your Excellence analytical balance to LabX laboratory software. METTLER TOLEDO's Advanced level analytical and semi-micro balances have readability down to 0.01 mg and capacities up to 320 g.
These reliable and robust balances provide precise results thanks to the MonoBloc weighing cell, easy data transfer and connection to peripheral devices via USB, RS232 and optional Bluetooth, as well as intuitive applications for efficient routine weighing. For easy cleaning, you can remove the QuickLock glass panels from your balance without any tools. Quality assurance features help you comply with regulations and industry standards. METTLER TOLEDO's Standard level analytical balances have readability down to 0.1 mg and capacity up to 220 g.
Electromagnetic Force compensation (EMFC) weighing cell with overload protection ensures that these balances deliver consistently reliable results. Multiple interfaces support barcode reader, printer and PC connections for easy traceability and data handling. Easy to use applications simplify routine weighing tasks. Our portfolio includes: dosing modules, printers, software, special vessel holders - ErgoClips, density kits, antistatic solutions, filter weighing accessories, and weights sets (CarePacks). With our accessories, METTLER TOLEDO analytical balances can be personalized to your needs in order to meet the specific requirements of most of the analytical weighing applications. METTLER TOLEDO introduces a new dimension in analytical weighing with a combination of intelligent features to make your daily weighing tasks easy and error-free. You not only benefit from the outstanding weighing performance of Excellence analytical balances but you can also be sure of full regulatory compliance and high process security. 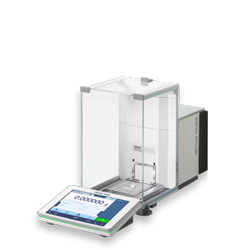 METTLER TOLEDO’s new Excellence Plus range of analytical balances incorporates a green status light to confirm that all the factors required for precise and accurate weighing in a Good Manufacturing Practice (GMP) regulated laboratory are correct and that the balance is ready for use. If one of these factors is not ready, then the light turns yellow to warn but indicate that it is still safe to weigh, or red to tell an analyst not to proceed. When the problem is corrected, the analyst gets the green light for weighing. Every weighing application and every workplace is unique. Whether your focus is on accurate sample preparation, error-free data handling or more ergonomic processes, you can combine XPE and XS accessories to create a dedicated weighing solution which meets your precise requirements. Explore our comprehensive range of accessories for more ideas on how you could benefit. In our brief Analytical Balances FAQ you will find answers to the most frequently asked questions, for example What is an analytical balance? | Where are analytical balances used? What are the application areas of analytical balances? | How to weigh on an analytical balance? | What is analytical balance uncertainty? | Why should I calibrate my analytical balance? | How should I calibrate my analytical balance? | Which tolerances apply to balance calibration? | What is the analytical balance minimum weight? | Analytical balance accuracy and precision – what is the difference and how to test them? | What are the effects of static electricity on an analytical balance and how to eliminate static charges? An analytical or semi analytical balance is a form of scale that measures mass to a high degree of precision. It has a weighing capacity in the range of 100-500 g (typically 200 g) and a readability of 0.1 mg – 0.001 mg. Analytical balance sensitivity requires it to be protected by a draft shield or an enclosure. 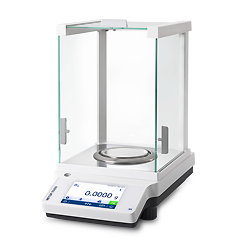 METTLER TOLEDO XPE, XSE and XS analytical balances are equipped with the SmartGrid weighing pan minimising air turbulence and therefore shorten stabilization times and allowing faster weighing results. Where are analytical balances used? What are the application areas of analytical balances? How to weigh on an analytical balance? To start a weighing operation, open the door and place a container on the pan using gloves or tweezers. Close the door and wait until the value stabilises, noting the weight. Clear the display by pressing the tare button until it reads 0.0000 g. Add the sample until the desired weight is reached. Close the door and again wait for stability - record the net weight. If the instrument is unplugged for cleaning, allow readjustment time before reuse. What is analytical balance uncertainty? When making measurements there is always an element of uncertainty. An estimate of doubt that surrounds it (the uncertainty) is key to any measurement. This is determined by measuring the performance of the balance, properties of the weighing object and environmental surroundings. Determination of measurement uncertainty is an integral part of a balance calibration. Why should I calibrate my analytical balance? Analytical balance calibration ensures that weighing equipment is accurate and satisfies standards such as ISO, GLP/GMP, IFS, and BRC. Documented calibration procedures indicate the quality of measurements, and should be performed regularly throughout the balance’s lifetime. Calibration should not be confused with adjustment of a balance, and must be repeated after adjustment/repairs. Read more on Calibration. How should I calibrate my analytical balance? Establish how well the instrument performs by testing the relationship between measurement standards and indications through calibration. Verify whether the instrument meets specific requirements with a Pass/Fail statement. If requirements are not met, adjust the instrument so that any deviation does not exceed tolerance limits. Re-calibrate the instrument to confirm compliance with specified tolerances. In between calibration intervals, routine testing by the user can detect potential issues. METTLER TOLEDO has developed a global scientific standard for the secure selection, calibration and operation of weighing equipment, GWP®, or Good Weighing Practice™. Which tolerances apply to balance calibration? Legal tolerances stipulated by OIML R76 or NIST Handbook 44 (US only) assess legal for trade requirements. These tolerances are quite large and easily met with laboratory balances, or when weighing at the lower end of the measurement range. Manufacturer tolerances ensure that equipment meets manufacturer specifications. Manufacturer tolerances do not consider user specific process requirements, and are unsuitable for improving the weighing process. Specific process tolerances defined by the user, support process improvements and savings on material, waste and rework. For scales in a legal for trade application, process tolerances should therefore be applied in addition to legal tolerances. Legal tolerances protect consumers but do not consider specific producer requirements. Optimising process tolerances that are applied to measuring instruments can have a large impact on process profitability. What is the analytical balance minimum weight? Every analytical balance minimum weight is different, depending on the performance of the load cell, its location, and ambient conditions. The minimum weight is the accuracy limit of the instrument, below this minimum weight, the relative measurement uncertainty (absolute measurement uncertainty divided by the load, usually indicated in %) is larger than the required weighing accuracy, and the weighing result cannot be trusted. In order to determine the minimum weight for a balance, measurement uncertainty needs to be assessed in the working environment. Alternatively repeatability, as the dominant source of error in the lower balance range, can be assessed to determine the minimum weight, carried out using a small weight, below 5% of balance capacity. The MinWeigh function of METTLER TOLEDO analytical balances, installed by a certified technician, monitors the minimum sample weight of the balance. If a weighing is below the determined acceptable minimum value, the balance display turns red. Analytical balance accuracy and precision – what is the difference and how to test them? Accuracy can only be determined by testing of the instrument at its location of use. View Laboratory Balances Tutorial - Basics and Weighing Influences course on good weighing practice. What are the effects of static electricity on an analytical balance and how to eliminate static charges? To ensure analytical balance static elimination, discharge the sample and container with an ionizer before weighing. Read additional information on electrostatic charges and the physics behind it.